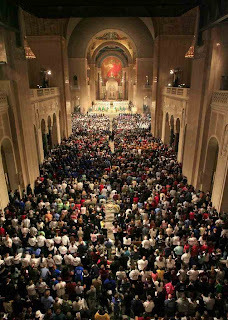 Earlier tonight, the 30th observance of the national Vigil for Life crammed a beyond-capacity crowd of well over 16,000 into the capital's Basilica of the National Shrine of the Immaculate Conception, the nation's largest church. For the last time, Cardinal Justin Rigali of Philadelphia was celebrant and homilist of the annual Roe-Eve Mega-Mass, its procession alone longer than most liturgies, all told. Next year, the gathering will be led by the already chosen leader-in-waiting of the US bishops' pro-life efforts, Cardinal Daniel DiNardo of Galveston-Houston, who memorably got in some practice for the Main Event early on the morning of last year's March for Life. The largest concelebrated Mass of every year on these shores, five cardinals, well over 100 bishops and a seemingly eternal stream of priests, deacons and seminarians packed the sanctuary for the two-hour Eucharist. Held each 22 January to recall the 1973 Supreme Court decision that legalized abortion, tomorrow's afternoon March is Washington's largest annual protest. During his "State of the Movement" homily -- interrupted by nearly a score of applause breaks -- Rigali announced that the crowd converging on the capital for the observances was already so massive that hordes of pilgrims had to be turned away from the Shrine, whose normal capacity of 6,000 was well more than doubled as almost every inch of the Byzantine temple, balconies and aisles included, teemed with pilgrims. To accommodate the overflow, Masses at other venues were celebrated by Archbishop Joseph Naumann of Kansas City in Kansas and Bishop William Lori of Bridgeport. With thousands encamped in the "Shrine Hotel" to spend this night either in adoration or simply to catch some sleep, tomorrow's activities begin with the traditional 7.30am Mass, celebrated this year by Bishop Paul Loverde of Arlington.